WASHINGTON (CNS) — Pope Francis has accepted the resignation of Bishop William F. Murphy of Rockville Centre, New York, and appointed as his successor Bishop John O. Barres of Allentown, Pennsylvania. 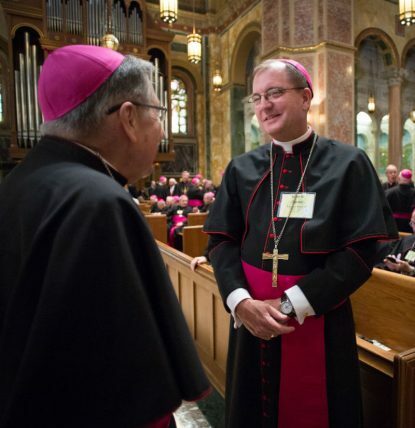 Bishop Barres, 56, has headed the Diocese of Allentown since 2009. Bishop Murphy, who has been Rockville Centre’s bishop since 2001, is 76. Canon law requires bishops to turn in their resignation to the pope when they turn 75. Bishop Barres’ Mass of installation will be celebrated at the Cathedral of St. Agnes in Rockville Centre Jan. 31. Until that time, Bishop Murphy will serve as apostolic administrator of the diocese. Bishop Barres will support Catholic Charities, parish outreach as well as Catholic hospitals, he added. He described Bishop Barres as “a man of prayer” above all. Born in Larchmont, New York, Sept. 20, 1960, Bishop Barres was ordained a priest of the Diocese of Wilmington, Delaware, Oct. 21, 1989. On May 27, 2009, Pope Benedict XVI appointed him bishop of Allentown. He was installed as that diocese’s fourth bishop July 30, 2009.